Crest on Barkly Hotel & Apartments - PH : 61395371788 Book Direct 2 Save. Standard Room - Bed and Breakfast Package for 2 people. Bedding configuration is 1 Queen bed. Standard Room - Bed and Breakfast Package for 2 people. Bedding configuration is 1 Queen bed and 1 Single Bed/Rollaway. Rates are for 2 people. Maximum occupancy is 3. Extra guest $30 per night. Bedding configuration is 1 queen and 1 single. Rates are for 2 people. Maximum occupancy is 3. Extra guest $30 per night. Bedding configuration is 1 Queen size bed and 1 Single. If you set out to find Melbourne's ultimate location for a business/tourist hotel, Crest On Barkly Hotel would be right at the top of your list. 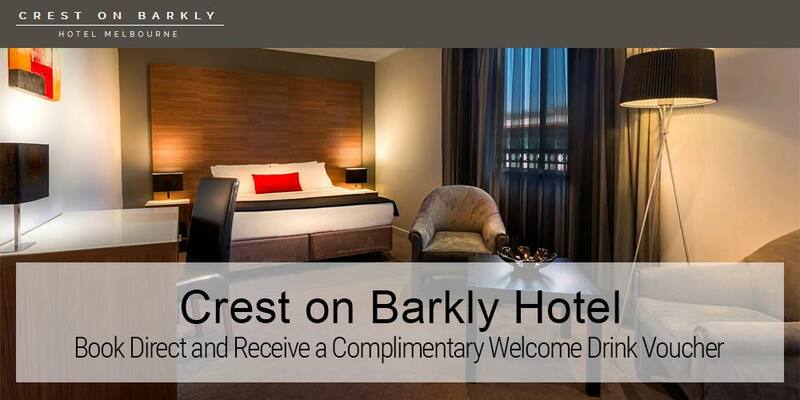 Crest On Barkly Hotel is in one of Melbourne's ultimate business and tourist destinations. Crest On Barkly Hotel is located right behind No. 1 St Kilda Road Melbourne. Just 8 minutes from Melbourne's Central Business District. St Kilda Road is recognised as one of the most prestigious business locations in Melbourne. Melbourne's famous trams run past the door ready to take you to those marvellous Melbourne attractions you've heard about. St Kilda, the hub of Melbourne tourism with beaches, Albert Park Lake, the Grand Prix circuit, Luna Park, Aquatic Centre, arts and crafts markets and famous cosmopolitan Acland Street are all just a short walk from the Crest On Barkly Hotel. The intercom was not working so a wheelchair user would be unable to check in on their own. Car Parking : Complimentary secure undercover car parking (1 Car spot per booking). Extra parking spots are available at $ 20.00 per car. Exit Flinders Street Station on Flinders Street. Walk to the tram bay on Swanston St.
Catch No. 3 or 67 Tram from Cnr Flinders & Swanston Street. Exit Tram at St Kilda Road, stop 31. Melbourne's famous trams run past the door ready to take you to those marvellous Melbourne innovations you've heard about.St Kilda the hub of Melbourne tourism with beaches, Albert Park Lake, the Grand Prix circuit, Luna Park, Aquatic Centre, arts and crafts markets and famous cosmopolitan Acland Street all just a short walk from the Crest on Barkly Hotel & Apartments.